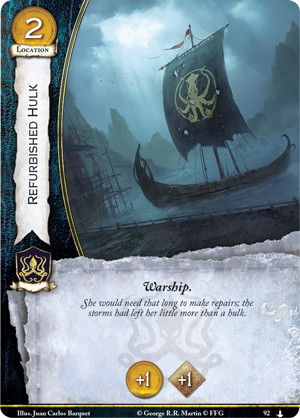 Over the course of A Game of Thrones: The Card Game, we’ve seen many longships enter the game, including Great Kraken (Core Set, 78) and Iron Victory (Oberyn’s Revenge, 92), not to mention non-unique Warships like the Refurbished Hulk (In Daznak’s Pit, 92). 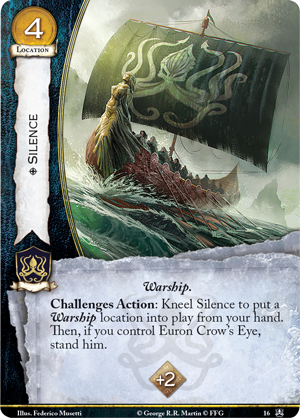 Yet one longship that has remained absent until now is Euron Crow’s Eye’s fearsome flagship— Silence (Kings of the Isles, 16). 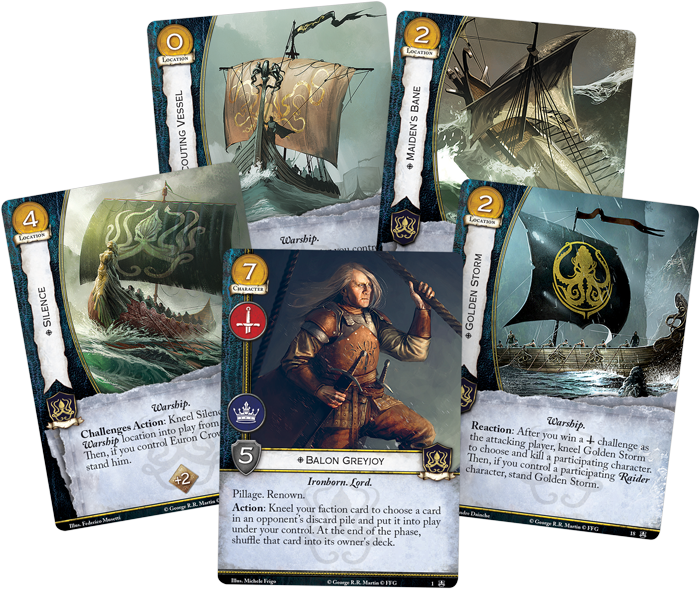 This longship boosts your initiative significantly, but more importantly, you can use Silence in challenges to put any Warship location into play from your hand—springing it into play without warning and without paying any gold! 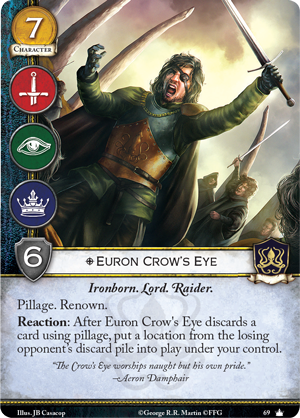 Then, if you control Euron Crow’s Eye, you can stand him, enabling him to participate in another challenge. 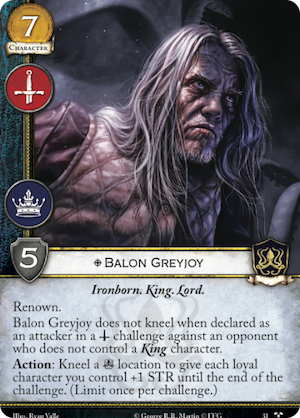 Of course, standing Euron Crow's Eye (Core Set, 69) is undeniably powerful, giving you even more chances to steal your opponent’s most valuable locations. 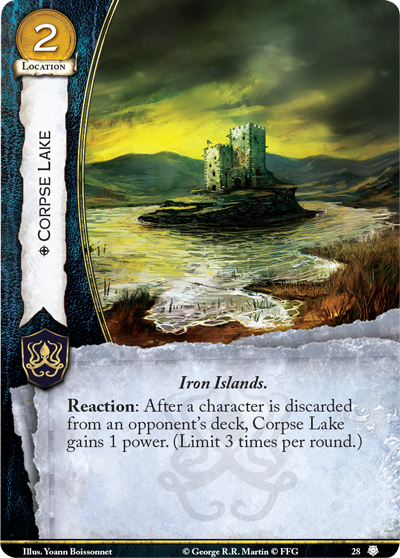 But you may choose instead to use the new version of Euron Crow's Eye (Kings of the Isles, 2). While his STR is lower than the Core Set version, he boasts the intimidate keyword and he lets you immediately put Silence into play from your hand, deck, or discard pile for free. 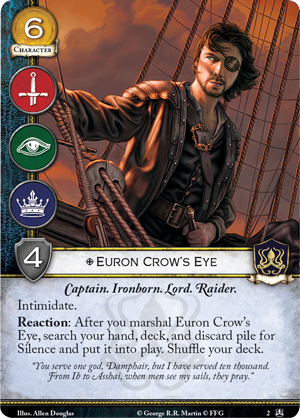 If you simply want to embark on Silence as quickly and cheaply as possible, this version of Euron Crow’s Eye could be an excellent addition to your Iron Fleet. 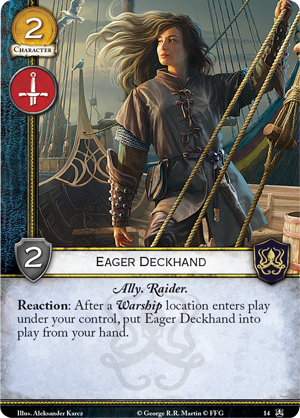 If gaining a new Warship mid-challenges isn’t enough, you could also include some Eager Deckhands (Kings of the Isles, 14) in your deck. Whether you marshal a Warship or spring it into play with Silence, the Eager Deckhand is ready to leap into play as well, swelling your forces and providing you with another unexpected character. Still, the true strength of Silence will be measured by the Warships that you can launch to turn the tide in your favor. We’ve already mentioned some powerful longships above, but Kings of the Isles also introduces newcomers to your fleet. 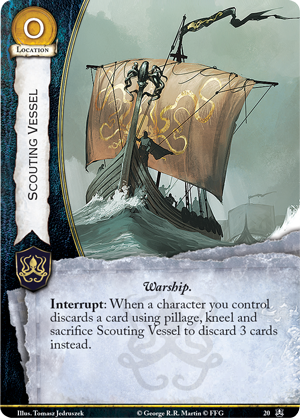 A Scouting Vessel (Kings of the Isles, 20) can make your pillaging more potent, helping Core Set Euron Crow’s Eye to steal locations or giving you more opportunities to trigger Corpse Lake (House of Thorns, 28). 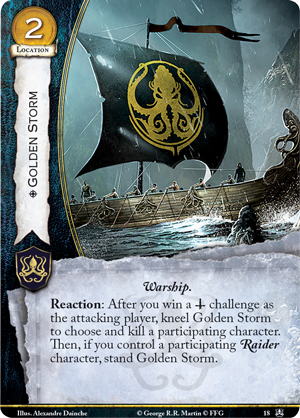 Or, you may set sail in Golden Storm (Kings of the Isles, 18), the former longship of Aeron Damphair. After you win a military challenge as the attacker, you can kneel Golden Storm to choose and kill a participating character! Of course, that’s much more dangerous if you bring Golden Storm into play with Silence after your opponent declares defenders. What’s more, if you control a Raider character in this challenge, you can stand Golden Storm, readying it to be knelt in service of another effect. Once the Iron Fleet is massed at your beck and call, you can deploy it to great effect—and it can even boost the STR of your own characters. 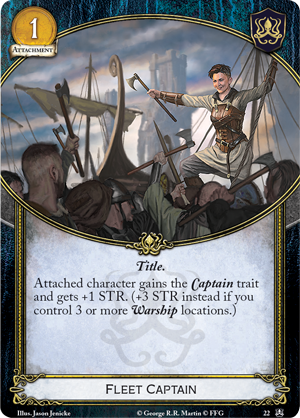 Fleet Captain (Kings of the Isles, 22) is a new attachment in this deluxe expansion, and so long as you have enough Warships, the attached character’s STR is increased by three! 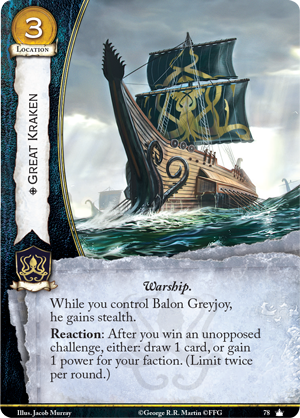 Combine that boost with cards like Balon Greyjoy (Called to Arms, 31), and none can stand against the massed fleets of House Greyjoy. 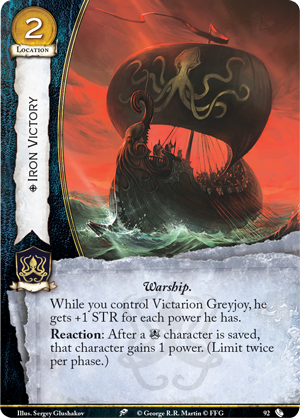 The power of House Greyjoy is rising with the tides, and in Kings of the Isles, you’ll be able to deploy the Iron Fleet to crush your foes. Which longships will you lead into battle? 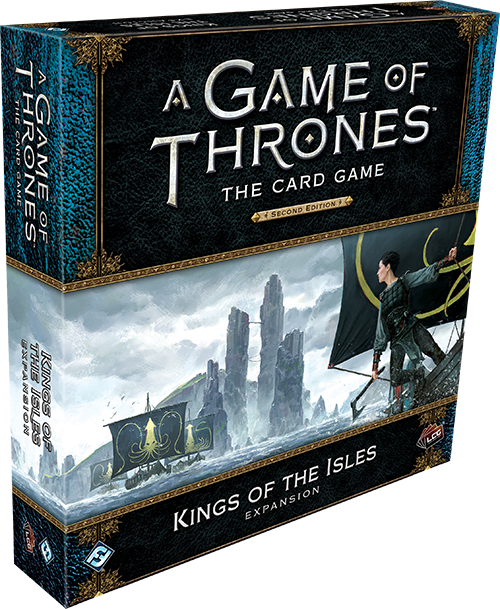 You can pre-order your copy of Kings of the Isles (GT45) at your local retailer or online through our webstore today!